InMotion Hosting is one of the best web hosts around and is the most popular choice among businesses for a secure and reliable experience. Established in 2001, InMotion Hosting can be considered a veteran in the web hosting industry. Backed by a team of experts with diverse technical backgrounds, InMotion Hosting focuses on the latest technology to provide the best reliability for a smooth experience. Being a business oriented company, they offer you a choice of data centers for faster speeds, FREE Automated Backups for peace of mind, and 24/7 US Based, in-house support. They also offer different hosting platforms to grow with your needs (Shared, VPS, and Dedicated). Overall, we think InMotion is a great choice, particularly for businesses. When it comes to web hosting, there are easily as many options available as there are stars in the sky. In fact, without a little bit of prior information on either the business, functions, or classes of hosting one might be looking to purchase, we haven’t a clue at all how a conscientious web master could ever make an optimal decision. 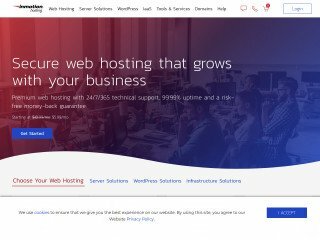 With that in mind, we feel it’s our duty to bring you the absolute best and the absolute worst on the most popular web hosting providers in town: And falling squarely into the former category, may we now present InMotion Hosting, a long standing industry leader and innovator within the field. 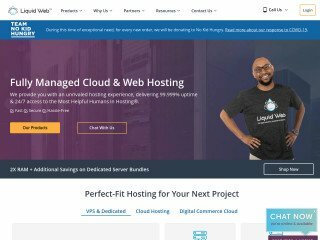 InMotion Hosting is one of our favorite options for personal, business, and dedicated hosting, offering a wealth of plans, features, and support designed to keep your Web presence running smoothly. But then again, all of that stuff can be ascribed to just about every web hosting business in the book. So, when the quick hits the bone, who in the heck really are InMotion? InMotion first took on its name and business way back when in 2001, arriving out of a merger between business and Internet capability. As such, the provider offers a unique focus to the business consumer, bringing an unparalleled level of services and support aimed at keeping Web-necessary content online at any and all times—even during periods of extreme stress. The company has been winning awards for these stellar services since as early as 2003, racking up a truly astonishing number of commendations since. Among these are the Drupal Association “Organization Member” aware, a CNET Certified Service Provider, an A-Rated Accredited Business with the BBB, the “Best Business Web Hosting“, the “Best Ecommerce Web Hosting“, the “Best VPS Hosting” awards from WebHostingGeeks.com, and the “Best Business Hosting” award from 100WebHosting.com—all of these given in the latest 2011 year. In other words, the company has existed for more than a decade, but has not slacked off on its duties during any time in that period. To see all awards of InMotion Hosting click here. Backed by a team of experts with diverse technical backgrounds, the company claims to be committed to its customer base, and according to its continued growth, it seems to be living up to all the talk. As mentioned before, InMotion comes absolutely loaded to the gills with all kinds of awards, commendations, customer testimonials, and general pats on the back. The company has been turning heads since its initial inception a decade ago, and now supports a track record few—if any—other web hosting providers can match. That all might be well and grand, but when it comes down to things, what in fact are those services that are so award-winning? Is it possible to knock them down into only a few bullets? In fact yes, yes it is! One of the things we love most about InMotion is that it allows the user to choose their server of origin, an unprecedented level of control that we can’t match to any other web host. Typically, a shared hosting experience assigns the user a databank somewhere in the country. This datacenter may or may not be closest to the user’s home demographic, potentially stripping the consumer’s site of all useable performance. In comparison, InMotion offers two East and West coast oriented options, based on their Max Speed Zones system. This system provides unparalleled protection and performance across the board, no matter what market you’re attempting to reach within the continental United States. In addition, for those hard to reach spots (like our native Denver) InMotion offers peer-based connectivity to give extra boosts as needed. Believe it or not, server banks are actually one of the premier causes of pollution in modern times. InMotion is one of only a few select companies to recognize this fact, and to have taken measures to lessen their initial impact. For example, the company now runs its technology and cutting-edge cooling systems that reduce server grid drain by as much as 70%. 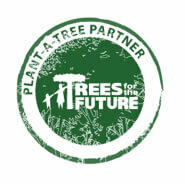 There’s also the fact that InMotion plants 5,000 trees a year to offset any negative impact it may put into the ecosystem. All in all, InMotion is green as it gets, and that’s an incredible thing. However, it isn’t just features, or general overviews, that get our goat about the web hosting company. In fact, almost more than anything else, it’s their unique dedication to solving and preventing customer complications as they arise. InMotion offers a fully operational 24/7 chat line for customers to call, day or night, for resolutions to their web hosting conundrums as they appear. Should you find yourself without a telephone, there’s absolutely no reason to panic. In fact, InMotion offers more than enough additional ways to get the job done, and have your website back up and running in no time. This includes a dedicated email support ticket system, live chat to aide you day-or-night directly from your computer, traditional email, and of course, the social networks. More ways to contact InMotion Hosting: http://www.inmotionhosting.com/contact.html. In addition, InMotion also offers a full support center that’s loaded with a knowledge base of Alexandrian proportions. There’s website and email tutorials, as well as domain name set-up information, and even tutorials on general website education. It’s as if InMotion secretly has an hidden agenda, and it’s to make you smarter than you were when you went in! And when all else fails, there’s also a community support forum where you’re free to ask other customers for their time-earned and trial-and-error advice. All in all, InMotion offers quite an impressive package on paper. They’re award-winning, have lasted over a decade, and offer a set of features that can be boiled down into a simple list, yet still strike the reader with a sense of overwhelming pizzazz. But don’t think we’re done with the company just yet: In fact, we’re only just warming up! Stick around, as we now change gears, and head directly into the hosting plans themselves to look for even more reasons why InMotion is one of the premier choices in online Web hosting. We have detailed a few of the ways in which InMotion might appeal to the carefully selective web master, and we have given a few of the ways in which InMotion is prepared to help its customers with any technical problems, should they arise. However, what we have not yet discussed was perhaps the most crucial part of the whole scheme—the hosting plans themselves! To this end, we are now prepared to dish the full details on the topic. So without further ado, dive on below to peep the full details on what makes InMotion’s web hosting plans absolutely essential for the conscientious business with a desire for a firmer Web presence. Without a doubt, shared web hosting is certainly the largest part of the market, and we have a feeling most of our readers will be looking for a quality package in this category. Shared web hosting is, after all, a great way to save on initial overhead while still garnering an incredible level of performance and Net presence. But how does InMotion stack up? Is it possible to achieve this level of success with the web host? The short answer: Totally yeah! We’re willing to take InMotion at face value, but the facts are all there to support exactly this sort of claim. Consider the fact that the company offers not one, but two different shared hosting plans. 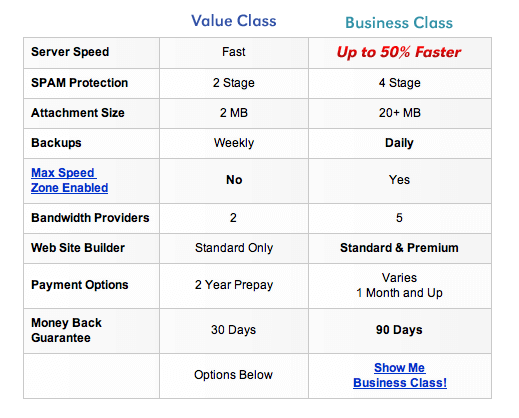 One, the Value Class Hosting is fast, offers SPAM protection, 2 MB attachment size, and even a web site builder. 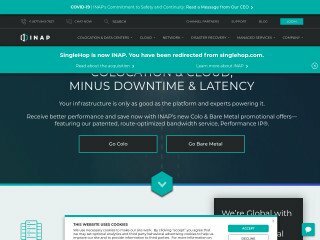 Should you need a little more oomph, there’s also the Business Class Hosting tier, which offers 50% faster server speeds, thanks to the Max Speed Zone capability, as well as increased attachment size, daily backups, 5 bandwidth providers, and a premium-style website creation tool. And across the board, InMotion offers a mammoth amount of functionality, including MySQL support, dedicated email accounts, FTP access, shared SSL, additional sub domains, and even support for popular coding and development platforms like WordPress, PHP, HTML5, and CSS. All in all, it’s an impressive package, and one that starts at as little as $3.00 a month. Visit http://www.inmotionhosting.com for more information. But what if you’d like just a step-up, but aren’t quite ready to commit to a full-on dedicated server with your business? What if you’d prefer to have your data physically separated from all the other tenants of the server, but can’t quite cough up the budget to get it done with a unique hardware set? With InMotion, it’s no trouble at all! The hosting provider offers a wealth of comprehensive and powerful virtual private server hosting options that are guaranteed to meet your needs and then some. Best of all, these plans start at only $39.95 a month—a cheaper price than we’ve seen just about anywhere else on the market. For that money, users can enjoy a bevy of ground-breaking features. These include 24×7 managed support, exactly as we mentioned in the previous articles. This means that, day-or-night, InMotion is available via phone, live chat, or email to help you with your virtual hosting needs. In addition, the company also offers burstable RAM for when peak periods creep up, as well as full data backups to preserve and protect your site from unwanted down-time. Not to mention a full cPanel and WHM license, granting you unparalleled access to the inner workings of your site—without even any need for complex HTML or CSS coding knowledge! To throw some last numbers into the mix, consider this: A virtual private server hosting experience with InMotion comes stock with up to 1024 MB of RAM, 3 GB of burstable memory, 1500 GB transfer limits, and 160 GB in RAID 10 Fault Tolerant Disc Space. And if that doesn’t sound like a bargain to you, we don’t know what else we can say (except move on to the next category, Soldier). And finally, the big one. If you’re looking for the utmost in performance, security, and personal web power, there’s no better option than dedicated server hosting. Typically, this kind of hosting would run you a quick bundle to own. But with InMotion, it’s nearly a walk in the park! Starting at as little as $199.95 a month, you can own and operate your very own server without even having to lift a finger. This process is made even more powerful by the fully-capable 24×7 support mentioned earlier, which guarantees your server is managed and operated personally by trained professionals. Should you be dissatisfied with the server’s performance, though, the company offers a full, 30-day money back guarantee: An offer we have not seen anywhere else but InMotion for dedicated hosting. To round out this part of our InMotion overview, have a look at some of the raw statistics (and power) behind the servers. A dedicated server with the company earns you up to 2.53 GHz, Intel Xeon Quad Core performance, tied to an 8 MB CPU Cache, and 8 GB RAM. In addition, pans max out at a whopping 500 GB disc space, and a 2500 GB monthly transfer limit. 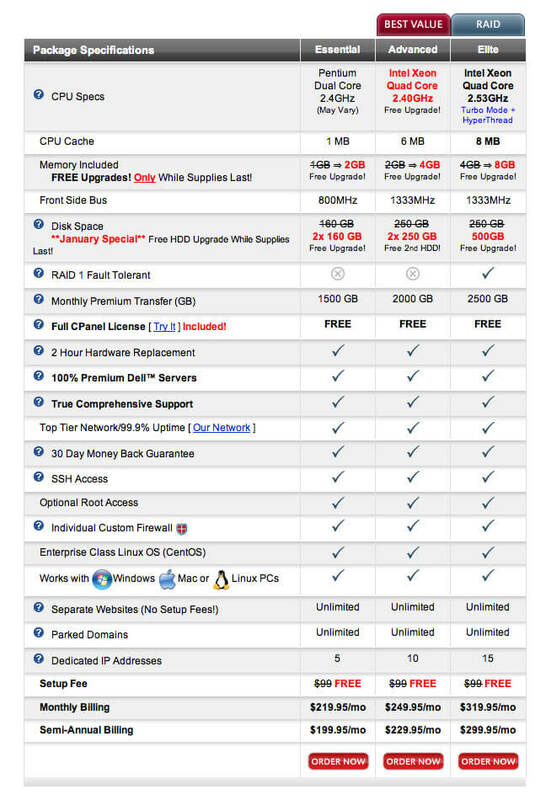 Add to this a full cPanel license, 2-Hour hardware replacement, and no set-up fee, and you’re looking at a solidly budget way to experience top-end performance. Whether you require a simple personal or business website, a more powerful virtualized environment, or your own dedicated server, InMotion Hosting definitely makes a fine choice for your web hosting needs and our visitors have confirmed that over the years. When it comes to web hosting, there are fewer names we recommend more than InMotion Web Hosting. The company has been in the business for one heck of a long time, and as such, they’ve really built up quite the reputation. In our reviews of them they’ve appeared to offer some of the best features around, and at certainly one of the better prices. However, paper looks can often be deceiving, especially in the world of web hosting. With that in mind, how is one really to know what the web hosting experience is like with InMotion? Simple! Read our user reviews. We’ve taken the liberty of compiling a few of the choicest and most clearly stated negative reviews we’ve received on the site about InMotion. You’ll find them all below, categorized by section, but before we get there, why not take a second, hard look at who InMotion claims they are? We feel it’s our duty to keep you informed, and as such, you’ll find a short summary below of some of InMotion’s biggest selling points. Hard-to-Get Refund: By and large, one of the most common complaints we received from our readers concerns the promised 30-day money back guarantee. By all indications, it appears that InMotion is somewhat reluctant to give up a client once they’ve been signed. In fact, it appears the web host will try just about anything to please a customer, save refund their money. Our users have had the company swap their server, add additional features, change various services, etc. Sadly, though, it appears they aren’t s ready to simply hand back the cash—an aggravating experience no matter how you slice it! Site Building Hoax: We haven’t seen as much of this complaint, but because of its severity, we still feel it’s worth mentioning. Apparently, it’s a rather hit-or-miss affair when it comes to having InMotion design your website. We’ve had a few readers complain of early payments, and then terribly late—or even non-existent—web designs being returned. In other words, some of our readers have paid for a web design, only to never receive it, or acquire it far beyond the promised deadline. If true, this is quite a troubling report. Not Very Helpful Help: We’ve seen this complaint with a few other major web hosting companies, and sadly, it seems like an epidemic. By all indications, the tech support specialists at InMotion seem to have a bit of an hard time providing answers or support for common hosting problems. Our readers noticed a special issue with virtual private servers, which the tech support representatives seemed ill-equipped to answer. All in all, we’d like to say you’re guaranteed a quick and professional solution from your tech support rep, but with the user reviews we’re getting, it just doesn’t seem to be so! Localized Downtime: Another issue our reviewers have been experiencing relates directly to the unique hardware layout we discussed earlier. It appears that, on occasion, one of the coastal databanks will go down, taking a load of websites with it: However, this usually spares the other coast any pain. On top of this, we’ve been getting numerous reports of long downtime, sometimes as much as several hours. Overall, we’re starting to get the feeling that the promised 99% uptime isn’t quite as accurate as InMotion would have us believe. The complaints don’t seem too out of the ordinary for a shared web host, but it’s still not spectacular news. Too Techy: On a more interesting level, it appears that some of our users—even the brainy ones—found the hosting experience with InMotion to be just a tad too tech-oriented. They often reported problems using the provided utilities, including the site builder, control panel, and even file uploader. Overall, it appears someone with even a basic understanding of modern technology can get by with InMotion, but headier problems will take a near rocket scientist to complete. And in our eyes, any web host that has you hitting the textbooks just to enjoy its service is hardly worth our time. Hacks Among Us: On another note, it appears that the web hosting provider is particularly prone to hacking. We’re hearing most of these reports emerging from the dedicated server camp, but no matter how you slice it, it’s still quite an uncomfortable feeling to know your data is at risk. The provider promises they’ve taken every necessary security precaution, but until we stop seeing reports of malicious break-ins, we can’t yet recommend InMotion for their security or stability against outside malevolence. All in all, we haven’t seen quite as many complaints out of the user reviews with InMotion as we usually do with other hosting providers. Still, you should always check our user-created reports before signing any dotted lines or agreeing to any forms of service. You just never know what you’re getting into, but with our user reviews, you can at least have a general idea. I would give their tech support staff 6 stars if I could. They are very responsive, pro-active and competent. I messed up my wordpress install (100 % my fault) and they helped me to get back on my feet in no time. I broke my jetpack sync - again they fixed it within 10 minutes of me reaching out. I provided incomplete information to the registrar which could have gotten my domain suspended. They informed me pro-actively incl. a step by step manual on how to fix that. When I struggled to follow the steps it took one email to get them to do it for me. No arugments, no "this is not part of our SLA" et.c. Great to work with! One of the best things about Inmotion is the customer service, they are friendly, helpful, patient and always ready to help you with anything else. 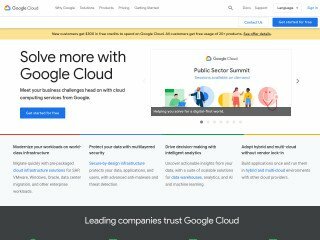 I have used Godaddy and Blue Host, both of whom have fairly good customer service, Inmotion actually stands out amongst these two big names. Inmotion hosting is a great resource for our business. We run a dedicated server that gets pretty decent traffic, and we can rely on inmotion to be there to serve our traffic needs. any time we have had a technical issue beyond the scope of our ability, Inmotion's support staff has consistently gone above and beyond to help us resolve issues. I would recommend Inmotion to anybody who is look for reliable uptime, great service and flexible pricing to fit one's needs. I own a few websites & use InMotion Hosting to display my websites. I love photography, but I am a reluctant web designer, as a way to showcase my photo work. As such, I am not very good at web design & deployment. I had a few questions recently, while upgrading one of my websites to a new sleeker, more modern appearance. I needed their tech support 3 times recently & InMotion provided answers to every glitch I ran up against. For that, I am extremely grateful..
Their product is great - but their service is absolutely out of this world amazing. I purchased a VPS hosting account to host client websites. Their product is great, but their service is absolutely out of this world amazing. The migration across was seamless (all 25+ sites) - quick and without a hitch. I'm not a sys admin, but I don't need to be - I've had a few teething problems, but they have always been there 24/7. If you don't use them, you are making a mistake. Product, service and tech support are awesome. They always take good care of me. Their tech support is available 24/7 live tech with very little hold time! They are easy to understand, patient, very helpful and through in resolving issues. I chose them for their support and it paid off. Great price too and they have lots of website and template options for every type of website you can imagine. I tried 3 different hosting services and dropped all of them because they did not have live tech support, their solution was chatting which is not sufficient when parts of hosting are so technical, you need a live person to talk to for quick resolution and that is what InMotion hosting is. I have been with InMotion Hosting for a very long time, so my comments are based on years of experience. Most website developers know what they are doing - I am not one of them. I am an engineer and scientist trying to get my website up with no background in HTML coding, JAVA - you name it I don't know it. InMotion Hosting tech support has helped me understand what is going on and how to fix my problems. I used the BoldGrid page builder to help with setup. For a website for my sister, I used Elementor Pro page builder and Phlox Pro template. The new page builder created more questions which the tech support team helped me through. This team of people is GREAT!! In Motion is lost in it's own quagmire. I've spent more than 30 hours trying to trace down how to do a simple price change using the tool they suggested. The path they gave made it so my site can't even take orders any more. When I complained about that, they told me to go to the plug-in company they recommended, which means they not only don't know how to fix it, they don't care to. When called for help, I waited on hold for now going on 2 hours. I'd chnage hosting companies, but to simply get here was an adventure that the non-technical wouldn't want to try. The ridiculousness of their "support" is beyond terrible. InMotion Hosting has resolved every issue I've had to date! I'm very pleased with their customer service! Cheap prices, but slow speeds, you get what you pay for! There prices are cheap, but keep in mind even a basic WordPress theme will struggle to load on their cheapo plans. No refund after 90 days, tech support average. I used to be a big Verio cheerleader. I used them for my servers for over 10 years. Then they sold out to Endurance and everything went to hell. My servers went to crap, my customer service became terrible. My tickets went unaddressed. And they lost all the DNS information on over 100 client sites and claimed they didn't have a backup. Thus my search for a new server company. I had pretty high standards and InMotion has hit all the marks. It's not cheap - but you get what you pay for. The value is there. Their customer service is fantastic. They are friendly, efficient, and knowledgable. They are green. They are based in the U.S. and are company-owned (so the risk of them being bought by someone like Endurance is slim). I highly recommend them. I never thought I'd fall in love again. I've been using InMotion hosting for many years now and they have always been very reliable and responsive. I've been able to get tech support at all hours and they are very knowledgeable. I highly recommend the company. Support here is great, I get answers quickly and without much hassle, I haven't experienced anything unpleasant and every single person was nice to me and has led me through process with patience. Prices are great for services I get fast and reliable web resller. When you try to cancel before the 90 day trial, be prepared to spend some time. There's no "cancel" > "click to confirm" button. There's a, email us, call us, or chat with us situation. Nice people, but technically, it shouldn't be so time consuming. I believe it's a deterrent method. Would like to mention a chat help I had with Johnathan P. He was very patient and explained things clearly. Wonderful service. I've been doing business with InMotion for approximately 10 years and have 8 active sites up with them. Their hosting is quite good but candidly isn't the thing that sets them apart. What I appreciate the most about InMotion is their support. The techs. are ALWAYS professional, responsive, and knowledgeable. I recently had an issue with a WordPress site that's on their servers. The difference between a good hosting company and a great one is that a good one will help you when you have a problem with their server. A great one will help you when they really don't have to. The performance issue turned out to be a WordPress based problem. Despite that their support team worked with me to resolve several critical issues that resulted in improved performance. I've been with several hosting companies and I can tell you that at least up until now their performance has been World Class and they will remain my first choice for hosting. Since HostGator was acquired by EIG, uptime and support started to go downwards, so I migrated to InMotion. I have peace of mind since. The support with InMotion is highly responsive and professional, Never had any issue with downtime. I can concentrate on my sites instead of being frustrated about things not working. All 100 of our websites were down for 48 hours and counting. From 5th May to 7th of May and the websites are still down. West Network Status Intermittent Connectivity to VPS servers. We are currently aware of connectivity issues affecting customers to our West Coast Data Center. Our System Administrators are investigating reports of packet loss across the Internet which are outside of our network. Customers within this data center may experience connectivity issues to their website and email. There is currently no ETA on this connectivity issue but we will post updates here as they become available. Thank you for your patience. Server Status: Unplanned Maintenance on VPS Node Our Systems Administration team has identified issues requiring unplanned maintenance on one of our VPS nodes. Customers may experience temporary loss of connectivity to website and email services. At this time we have no ETA, but we appreciate your patience. Hi. Thanks for checking out this WebHostingGeeks video review. Visit our website, at WebHostingGeeks.com to see more reviews, and to get the latest information on all the top web hosting services. Today, I’m reviewing InMotion Hosting. InMotion Hosting was founded in Los Angeles in 2001. They rapidly expanded, opening a second office and datacenter in Virginia in 2004, and since then have expanded that datacentre and their new, energy-saving, green facility in LA. They provide business-grade shared hosting, as well as virtual private and dedicated servers. They currently host just under 244,000 sites, and that number has changed less than 1% over the last six weeks. We’re going to look at InMotion’s product offerings, and we’ll focus on their shared server support. However they also provide three tiers of VPS service, and six levels of dedicated servers, including 3 levels of commercial class service running on Xeon servers with RAID storage. We’ll look at those in another video perhaps, but for now, let’s take a look at the level of service most of us need to host our day-to-day websites and blogs. Shared hosting means everybody shares the same resources on one or more servers. Each website or blogsite is secure and completely independent from the rest, but they all get an equal share of the available CPU, storage and bandwidth. 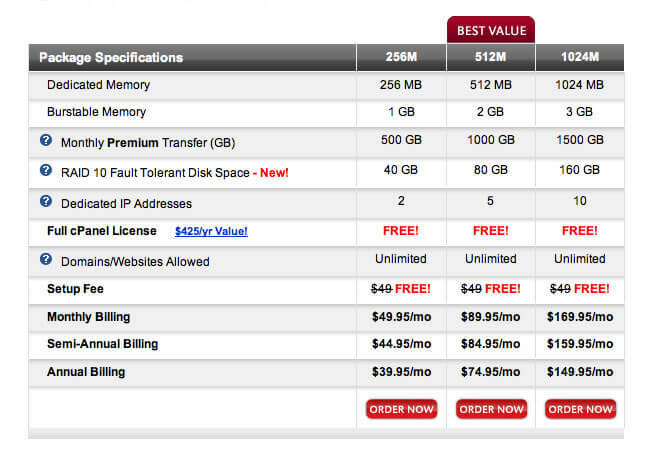 The advantage is a price that’s considerably less than you’d pay for your own, private server. And the features you get with shared hosting are often more than you’d get with your own server. Most of us aren’t webserver geeks, and we don’t want to worry about the infrastructure. 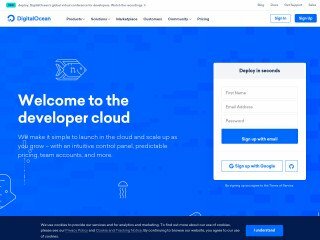 A shared hosting solution gives you many easy-to-use tools for creating and managing your blog or website, so you don’t have to roll your own solution by hand. InMotion Hosting has three levels of shared hosting called Launch, Power and Pro. Each one gives you unlimited storage for your site’s files, unlimited file transfers to and from your site, unlimited email, and an equal share of the 1 Gb/s network bandwidth. All shared hosting plans offer Solid State Drive storage, for fast access and improved reliability. New subscribers who sign up for at least six months on the Pro plan or twelve months on the Launch and Power plans, get a free one-year domain registration. Or, you can transfer in your existing domain from another server, with up to three sites, for free. You’ll get a temporary URL to use during the move so there’s no downtime while you get it set up. Something that sets InMotion apart from a lot of the competition is their free backups for all sites under 10 GB. That’s automatic, every 36 hours, and you can have one free restore of your entire storage space every four months. If your site is larger than 10 GB you can still have automated backups for a small fee. The number of sites and databases you can have varies with the three plans, starting at two sites and two DBs for the Launch plan, up to unlimited everything at the Pro level. Something else that varies by plan is the amount of free Google Adword credits you get with your account: up to $275 for the Launch plan and up to $300 for each of the higher levels. Email services are free and unlimited on all plans, and they use IMAP protocols, unlike a lot of hosts that only support POP3 for downloads. This gives you more flexibility to manage your email across multiple devices. All accounts get the latest Softaculous app installer, with its suite of over 310, one-click install apps. The apps include WordPress, Joomla, PrestaShop, Drupal, Moodle and hundreds more to help you create websites, blogs, shopping carts, image galleries and all the other great stuff you see online every day. If you like, InMotion will pre-install for free, your choice of WordPress, Joomla or PrestaShop. That way, you can get started building your site right out of the box with the tools you’ll need already in place. And speaking of WordPress, InMotion hosting makes setting up and maintaining a WordPress site even easier. They install for you something called the WP-CLI. That stands for WordPress Command Line Interface, and it lets you easily manage multiple WordPress sites and plugins from the command line. All shared hosting plans include a licence to build one of your websites using the Premium Website Builder. Of course, you can build more sites manually or using a CMS like WordPress or Joomla. You can add more Premium Builder sites for $15 each per year. This tool lets you build a website, photo gallery or blog based on hundreds of customizable templates. At the Power and Pro levels, you can also use it to create a full-function e-commerce site with inventory management, shopping carts, shipping calculator and payment integration. Last but definitely not least, is InMotion’s 90-day, money-back guarantee. If for any reason you’re not happy with their products or service, they’ll refund your full subscription, minus your domain registration fees of course. The domains are still yours, and you’re free to transfer them to another host. If you choose to leave after your 90 days is up, however, there is no pro-rated refund for the remaining term. So how is InMotion performing? Well, according to uptime.besthostratings.com, they’ve enjoyed 100% availability since October 2012. Prior to that, they rarely managed a month without at least one unplanned outage, and achieved an overall rating of 99.89% – just off the industry benchmark of 99.9%. However, since October 2012, they’ve had no outages, and hit 100% every month. This may be because they replaced the Fantastico app installer with the newer, more frequently-updated Softaculous in September of that year. Or, it might be because, 7 months earlier, in March 2012, they invested a quarter of a million dollars in technical support staff and equipment. What do their customers say? In 2010, customer satisfaction was 4.19 stars out of 5, or 83.8%. With the exception of a slight dip due to a hacking incident in 2012, that number has risen to its current level of 4.35 stars, or 87.0% . Since mid-2012, customers seem very happy with InMotion’s professional and timely customer support. They also rave about their trouble-free service and reliability. Prior to that, there were some complaints about sites that had been suspended for suspicious or potentially hazardous activity. There were also a few negative comments from customers who wanted features that weren’t supported at the customers’ service level. They accused tech support of trying to up-sell them, when in fact, they really needed to move up to the next tier or buy dedicated service to get what they needed. It’s interesting that most of the negative customer reviews predate the customer service expansion in early 2012, and recent datacenter upgrades in 2013. It’s possible that InMotion was just growing too quickly, and the quality of their services and support was struggling to keep up. To put InMotion Hosting to the test, we’ll now go onto their site, sign up for a hosting account and register a new domain name. I’ll select Launch, their low-end shared hosting plan, and have them preinstall WordPress during checkout. Then we’ll see how long it takes to complete the transaction and what kind of confirmations we receive. Let’s go. Remember, Web Hosting Geeks is the biggest hosting review site out there and hosting companies always give the best specials online to Geeks visitors. To get the current special, simply visit webhostinggeeks.com/user-reviews/InMotionhosting/ and click the green button. Notice I can choose from all the plans here. I’ll pick 12 months of Launch, and click Continue. …and it is. And here we’re offered our first upsell – the chance to upgrade our plan from Launch to the next higher level, Power. I’ll leave that blank and Continue. Next we have a chance to buy domain privacy—If you select this, anyone doing a search for the owner of your new domain will see InMotion’s contact info instead of yours. And finally, we can choose whether we would like InMotion to pre-install one of these three content management systems for us. I’m going to choose WordPress. Now comes the fun part – I’ll just whip out my credit card and fill in my payment details. I can see what will be charged to my card, right here. Everything looks good. Also we’re reminded to read the Terms of Service, and that our card will be billed automatically every 12 months. If you’re happy with all this, you can check off “I Agree” right here, and then complete the transaction by clicking the Purchase Account button. This takes us to the order confirmation screen. Here this tells us that our account will take a few minutes to set up, and that we’ll get a confirmation email when it’s done, and a follow-up call from a New Account Specialist. While we’re waiting, we’re offered a free five-minute phone consultation about InMotion’s website design services. I haven’t used this service, but a free consultation is a pretty good thing, especially if this is your first website. And that’s it. InMotion gives us a final look at their support numbers and a confirmation of what we’ve just purchased. I’ll write down that support number, because coming up next, I’m going to give support a call, and see how they handle a question from a new subscriber. InMotion Hosting [IMH]: Thank you for calling Support. We are currently having higher-than-normal call volumes. Please stay on the line and an associate will answer your call very shortly. Thank you for your patience. IMH: Hi. How can I help? GEEK: My name is Rick and I have a question for you. I just signed up yesterday for a new account, and I’ve noticed that at the various service levels—I’m at the launch level—there’s a number of databases available. Can you tell me what I’d used a database for? IMH: Yes. Usually it’s for, um, people use it for, like, a WordPress or Joomla installation, a CMS. I can tell you if you’ve used any so far and what they were used for. IMH: That would have used one of them, uh-huh. GEEK: If I also wanted to install something like an image gallery and possibly an installation of Moodle, do they each use their own database as well? GEEK: Is there any way that I can install something like Moodle and an image gallery and WordPress without, um, using more than two databases? You can just, um, for instance, like, for WordPress—and it’s a little difficult to describe, but I will attempt to anyway—so you have a database. That database is going to be called ‘your cPanelname underscore something’, we’ll say, ‘your cPanel7_WordPressDatabase. OK? So your first WordPress installation, as a general rule Softaculous likes to default to ‘WP_’ as a table prefix. So inside of this cPanel7_WordPress there are tables that start with ‘WordPress_’, whatever, like one of them’s ‘Options’, right? You can install it manually, which is actually not that hard with WordPress. I will not promise for, like, some of the image galleries, and you can tell it, instead of using ‘WordPress_’, use ‘WordPress2_’ or use ‘Image_’. And that way you have one database and different sets of tables. GEEK: Using multiple schema in the same database. IMH: Yes. Pretty much all of the information is available in the codex. GEEK: Well you’ve really answered my question today. That’s great. IMH: Awesome. Do you have any other questions for me? GEEK: Um, no. I think that that solves it for today. I didn’t get your name though, when you first came on, sorry. GEEK: OK thank you very much Kimya. I’ll let your supervisor know you did a fabulous job with me today. IMH: Alright. Awesome. Thank you for that. Do you mind if I get your domain so I can note your account? IMH: We are 24/7, and if you get interest or feedback feel free to leave some. GEEK: Terrific. Thank you very much for your help. IMH: You’re welcome. Have a great one. AMP is InMotion’s proprietary control panel that is used to manage your account, billing, request support or purchase additional products, like hosting, domains and SSL certificates. AMP also has a lot of shortcuts to your common hosting operations like creating email accounts or installing WordPress. All these functions are always available in your cPanel. cPanel is the most commonly used control panel in the world and InMotion has it. Most of your website operations will be done here—tasks like creating email accounts, managing FTP users, and installing apps like WordPress, Joomla, online stores and image galleries to name just a few. cPanel is feature-rich and easy-to-use. No wonder it is fast becoming industry standard website control panel. So InMotion definitely stands at the top. cPanel with Softaculous—that gives you 310 applications with single-click installs—and AMP, their easy-to-use Account management panel that you can use to access cPanel, and manage your InMotion account. You can get more detailed information, often with videos, about AMP and cPanel and anything else you may need to operate your hosting with InMotion, in the Support Center, at www.inmotionhosting.com/support/. All in all, we were impressed with InMotion’s range if plans and the features they offered, especially using Solid State Drives on all plans, and offering a 90-day guarantee. They also have great WordPress support. Between 2005 and 2012 they had some growth issues, but that seems to be behind them now, and they have logged a solid 100% uptime since 2012. The majority of customers are very satisfied with InMotion’s service, and give them an 87% approval rating. 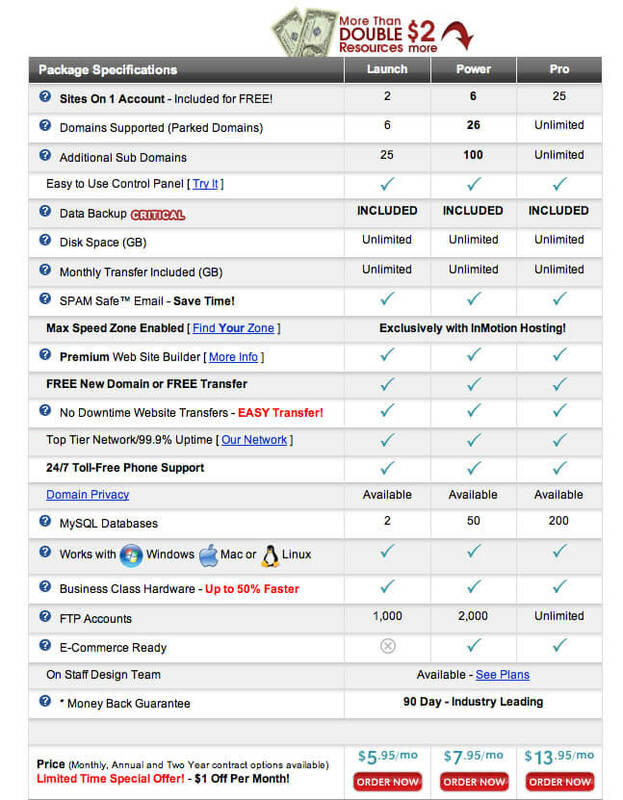 Buying a hosting plan was easy and straightforward. Finally, when we called Customer Service, we had our question answered quickly and professionally. We’ve enjoyed our experience with InMotion Hosting, and we can recommend them to you. Thanks for watching. Come on back for reviews of all the top hosting services, at WebHostingGeeks.com.